Inspired by The Sorted Books Project, Grab a Pen and Write Brained, I decided to have a go at making poems out of book titles arranged in a certain way. It was great fun to do, and now I want to do more. During my 10 day holiday from work coming up soon I might go to the local library and make loads of poems like this, so expect lots more soon! Here are a few poems I made using the books in my living room. Just read down the book titles on the spines from top to bottom. New moon, her fearful symmetry the colour of magic. Holy Bible, the book of ultimate truths. What do you think? 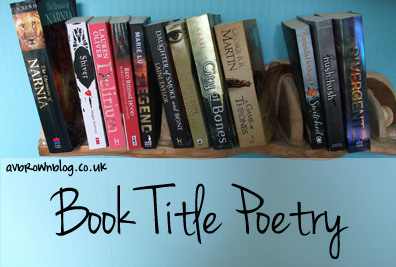 Have you ever tried making a poem from book titles?